So I'm at work on a Saturday, waiting to do my part of a system upgrade, when I type 'Fish Print' into Google. I was looking to buy fish art for my office. I ran across a web site for Gyotaku and take an immediate interest in the subject. I spend the next few months researching everything I can about gyotaku, practicing in my mind how I'm going to make my own fish prints. I even bought a few through the internet. It finally gets warm enough the following March to catch a few bluegill in a local pond. Armed with red acrylic paint, news print and my then 8 year old daughter as my assistant, we make some prints which look like fish shaped blobs of ink. Not discouraged, I practice and practice until I feel comfortable enough to use rice paper, rather than news print and block printing ink, rather than acrylic paint. The following fall, I signed up for my first art show. Since then, I've joined the Nature Printing Society, the Pennsylvania Guild of Craftsmen and the Greater Norristown Art League. 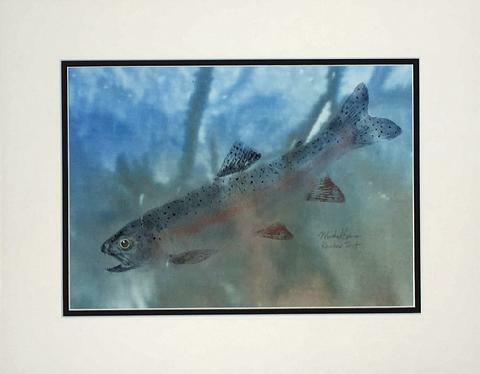 I served as the vice-president of the Nature Printing Society for 2013 and 2014 and have taught beginner fish printing at two of their annual workshops.